Tuners the world over have turned their collective attention towards the task of making vehicles lighter for increased speed and efficiency. One avenue of achieving these goals has been through the ample application of carbon fiber parts. Tuning specialist Vorsteiner has also pursued this track, and is now showing off the first glimpse of its upcoming carbon fiber boot lid for the latest BMW 3-Series Convertible. The new, lightweight trunk lid incorporates a built in "duck bill" spoiler that invokes images of the one found on the BMW M3 CSL special of the E46 Series. Vorsteiner claims that this is undoubtedly the lightest convertible trunk lid in the market to date. The company has also added that all OE mount points will be carried over for uninterrupted usage of the folding hardtop, which is good news. Enjoy the photos of the new addition. 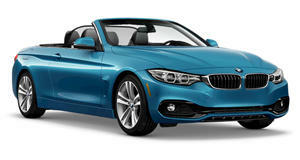 BMW charges a steep premium for the hardtop four-seat 4 Series.